"This authentic traditional Arabic recipe consists of chicken, cauliflower, and potato. Serve with plain yogurt and a salad to mix with the rice dish. This is very easy, it just has a lot of work." Place chicken in a large pot with 6 cups water, onion, 2 tablespoons allspice, ground cardamom, cardamom seeds, whole cloves and bay leaves. Bring to a boil, and cook until chicken is tender, about 40 minutes. Remove chicken, strain and reserve broth. Soak the rice in water while waiting for the chicken to cook. When the chicken is almost done, drain the water off, and stir in 1 1/2 tablespoons of allspice. Heat the oil in a skillet over medium-high heat. Fry the potatoes and cauliflower in the hot oil until browned. They do not need to fully cook. In a separate pot, layer fried potatoes on the bottom. This is done so that the rice will not stick to the bottom of the pan. Add the cauliflower and tomatoes, and sprinkle a handful of rice over the vegetables. Remove the bones from the chicken and place the chicken in the pot. Cover with the rest of the rice. Pour in the reserved broth until it reaches a level about 1/2 inch above the level of the rice. Cover the pot, and cook over medium-low heat for 1 hour, until rice is tender. When the liquid has absorbed, have a large round tray ready. Uncover the pot, and place the tray over the top. Invert so that the pan is upside down on top of the tray. Let stand for 5 minutes like this, then slowly remove the pot to let the food fall onto the tray. You may substitute 1 large eggplant for cauliflower or use both. Slice eggplant in rounds on the larger pieces cut in half. If using eggplant with the cauliflower, add it to the pot along with the cauliflower. This is a great all in one meal. It smells wonderful while it's cooking. Put it on a fancy platter and it looks beautiful. It is really simple to make. Thanks so much for submitting this recipe. 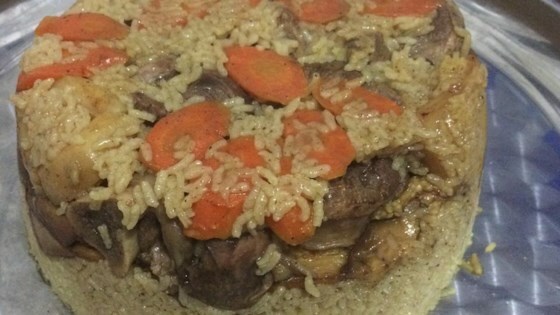 I am a newly converted American muslim, and I have tasted and seen this dish prepared by other muslims. Its nice to have my own recipe now. Thank you! This recipe tasted better than any maalooba dish i have ever tasted. It was so authentic and tasted better than my mothers. Thank you imankay for this recipe keeper!! Very good maqlooba recipe, love the addition of tomatoes. I halved the recipe and worked out great.